"Mother, are you sure your marijuana use is purely medicinal?" This cartoon appears in the current Private Eye. Often, with gag cartoons, when you first come up with the idea you want to throw everything including the kitchen sink into the joke, and then you find you have to simplify it. 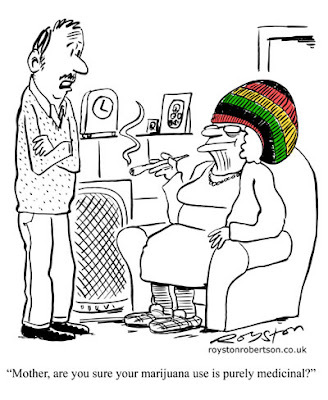 With this one, the old lady was originally going to be holding a Bob Marley LP, and I even considered putting her in a "Legalise it" T-shirt, complete with cannabis leaf logo! In the end the Rasta hat and slightly stoned expression seemed to be enough. There was a time, I think, when I think a cartoon like this would have been considered racist, as it plays on black stereotypes. Thankfully, we've moved on. 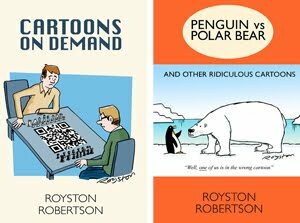 The fact is that a lot of humour, particularly cartoons, plays on clichés and stereotypes, and as long as they're not used to incite hatred, I don't think it's a problem. This TV sketch, for example, may not have been aired a few year ago. But it's not racist, it's just funny.